I had a choice of whether or not to go to jail. I could have paid a $5,000 fine or done 240 hours of community service instead. 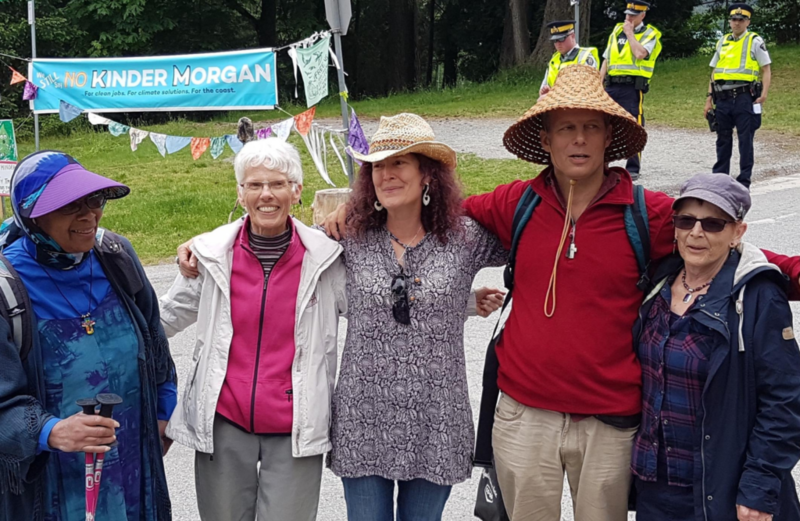 But it seemed to me that being willing to go to jail was part of making my point — that planet Earth is too precious to risk the economic and political adventure that is the pipeline expansion. Our First Nations neighbours have been clear in refusing permission for a pipeline on their land. I believe the Creator brought the Earth into being and that divinity is present in every tree, rock, salmon, orca and drop of water. We are surrounded by and immersed in the presence of God and it is nothing less than sacrilege to allow this amazing creation to be destroyed. I’m also a spiritual director, which means I help facilitate a person’s connection between them and God, and part of a peer supervision group for directors. About a week before court, I learned that all of the group members had committed to light a candle and pray for me, one on each of the seven days I would be in jail. Friends also made a point of wishing me well, offering hugs, joking about files in cakes, and letting me know they stand with me. I was not alone. As the five of us who were arrested that day sat on a bench facing the judge, Tracy, an Indigenous man, reached over the railing from the visitors’ gallery behind us and shook our hands, then passed us an eagle wing — not a feather but a whole wing. We took turns holding and stroking it as the judge spoke. We were offered intermittent time, which would mean we could basically spend weekends in jail. 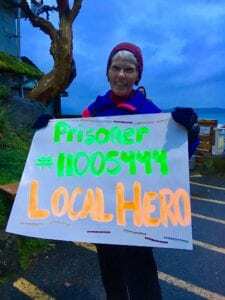 That wouldn’t work for me from my Saturna Island home, and Jo Ann, who sat beside me, chose to reject the offer and be with me in jail. We were taken one by one to the holding cells in the courthouse building. I turned around to smile at my husband, David, and saw that all the people in the visitors’ gallery were standing with hands outstretched towards us. We were not alone. Once outside the courtroom, the young woman escorting me asked me to put my hands on the wall and patted me down before putting on my wrist shackles. She seemed to be fumbling with them, and explained that she was orienting the shackles so they wouldn’t rub on my wrist bones. Her kindness was a reminder that Spirit can appear in unexpected places and people. When we got to the cells, the other prisoners were friendly, interested in the protest we had been jailed for, and amazed and indignant that we were serving time. Jo Ann and I gradually got to know the other women, to appreciate their individual personalities and to hear some of their stories and their hopes for the future: hope for lasting sobriety, for a job, to get a child back. April was one of the most cheerful and helpful women I met in jail. But all of the women were kind and generous. Several offered us shampoo, conditioner, skin lotion and “jail candy” made from coffee whitener, sugar, butter and jam. It was surprisingly good. The guards were also pleasant. One of the staff said quietly, “I see you as political prisoners. Thank you.” That was the first time that tears came to my eyes. Another was the day I was summoned to the nurse’s office for discharge planning (both Jo Ann and I were released after four days and four nights). She asked about the conditions I would be going home to. Did I have support there? Was there anything I needed? I told her that I hadn’t been able to contact Errol, a volunteer who had offered to pick us up and drive us to Vancouver when we were discharged. She said that she couldn’t let me use her phone but she could call for me. She contacted Errol and made the arrangements. I found myself teary. I assured her that I would do that, and told her that the tears were not about sadness. They were about the kindness of so many people, including her and our driver who was a stranger to me. “I feel almost overwhelmed by love,” I said. The evening I arrived home, the community had a “welcome home” potluck. After the meal, several people stood up to talk about what it meant to them that I had acted on my convictions. I spoke about my gratitude to them and about the women who were spending much longer in jail than I, many of them addicted, many repeat offenders who didn’t seem to see a way out. I have been changed by this experience. I hope that I do not take my life for granted ever again. I know now that doing something difficult can bring unexpected rewards, and that I am not alone, ever. So, you purposely broke the law, (and made no promises not to break the law again), and then ask God to protect you? Hebrews 13:17 and Romans 13:1 states we are to obey those in authority over us. We may not like the decisions that our Governments make, but we have the freedom to elect them, or others if we're not satisfied, among other options. In my opinion your not a hero, just a person with a criminal record. Personally, if I were you, I wouldn't be proud of myself. Consider Daniel prayed to God despite the orders of the king. He believed in a higher power, justice. There are times, a person must stand up for what is right and just. Daniel's defiance had nothing to do with justice. Daniel was serving a higher power - God, not justice. He also did what he was accustomed to do daily. Finally, Daniel was also "set up", "justice" (as you put it) was served by those framing Daniel. I really appreciate being a member of the United Church of Canada and receiving inspirational stories such as Ms. Rees-Thomas' which remind me what life is all about. Matthew 5: 17-18 Christ came to fulfill the Law, not "break" it. This is why He paid the price. True followers call Him LORD, more than a hero. I have yet to read that God promises health and healing for anyone who earns it. Prosperity gospel promises all sorts of blessings, but it is a false teaching. As believers, we are only promised an eternal destiny - and God living within us - nothing more. If you're looking for deeper meaning in life and courage read and study the Psalms. Why are you celebrating misguided illegality? I'm sure she went back to her heated, electrified dwelling, and may even have driven a car. Hypocrisy abounds, and her white privilege is in full display. Jail tourism? That is offensive. l can relate to all the comments here but we miss boat we ignore the message that God is to be everywhere . God is everywhere, past present and future. God is not in everything (tangible). If the writer does not appear to have integrity, in respects to the law, then why should I listen to her message? It's telling me "It's OK to break the law, if I "feel" it's for a good cause" (Not supposing that nothing good may have came out of the situation). Standing Together for What is Right is a Precedent' to be Admired when Those of Us make Certain the Commitment in HUMANITARIAN ADVOCACY. i know and have been locked up twice for doing the Honest Right Stance. Each Time it cost many thousands of Dollars to Stand Up' for what is Right'. The last time Standing for what is Right was referred by Justice Brown in the Courtroom of Osgoode Hall Courthouse / Toronto Ontario as a 101 Year Precedent that would Set to Perpetuity Section 149 of the WORKPLACE SAFETY AND INSURANCE ACT for All Worker's. As Worker's We " Won ". I am encouraged as a senior by your shining beauty. Stories like these continue to bring hope, hope that light will overcome darkness. I was a conscientious objector in the country of my origin. It was a personal decision accepting consequences on the basis that it was the right decision for me. I fully respect those who have to make such a decision and have another outcome. Sally McLean was arrested after she refused to leave the Ontario legislature's public gallery in an act of protest. Here, she explains why she thinks she is obligated to stand up against injustice.